Have you heard the buzz and jumped on the turmeric train? It’s been a staple for me in my post workout recovery for quit sometime and even my injury recover last couple years and again in the past few weeks. I remember first adding it to my post workout smoothie and then falling in love with Golden Turmeric Milk. It’s only natural for me that when something becomes a staple I have to play with it which has resulted into a few variations of Golden Turmeric Milk but more recently I’ve been loving this Bee Sting Turmeric Latte. Tweaking and trying with all my local Bare Honey flavors trying to find that perfect match but I love them all. 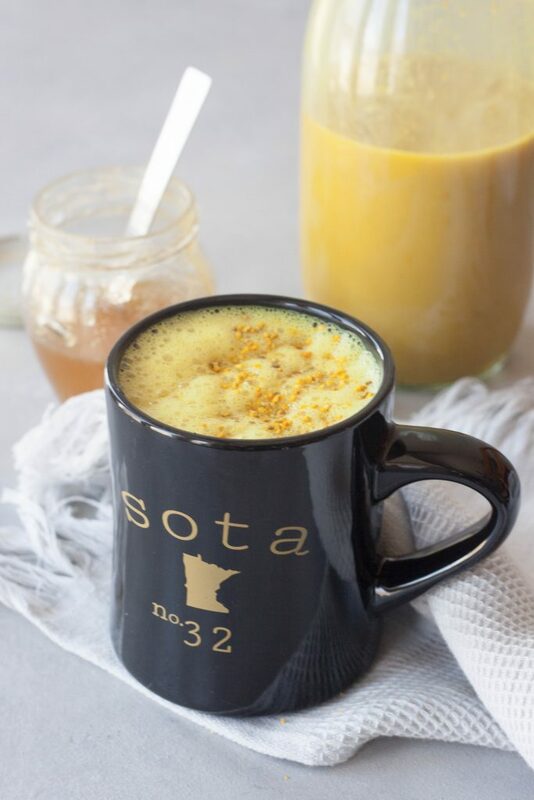 This Bee Sting Turmeric Latte is like a traditional turmeric latte but with a sweet and spicy twist. 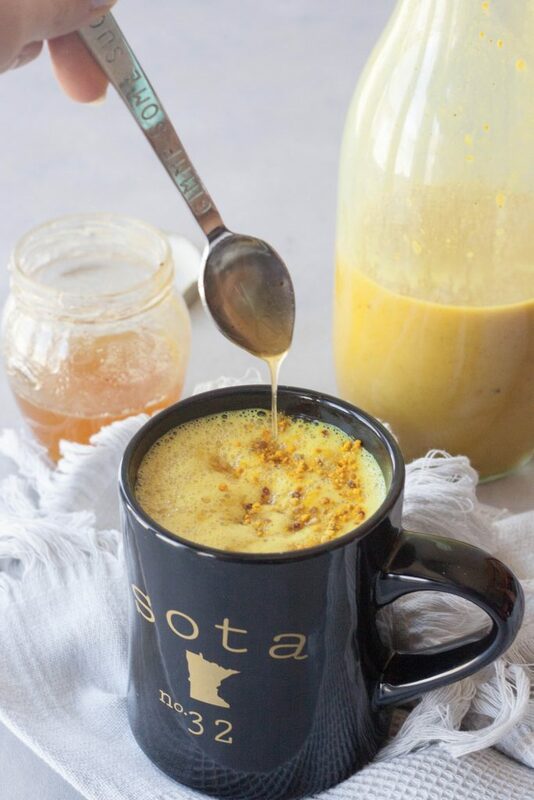 Honey or sweetener is common in golden turmeric milk but instead of adding it to my turmeric milk when I make it I add it when I make the latte and even drizzle a little extra on top to make it extra sweet (don’t read that is sugary sweet). 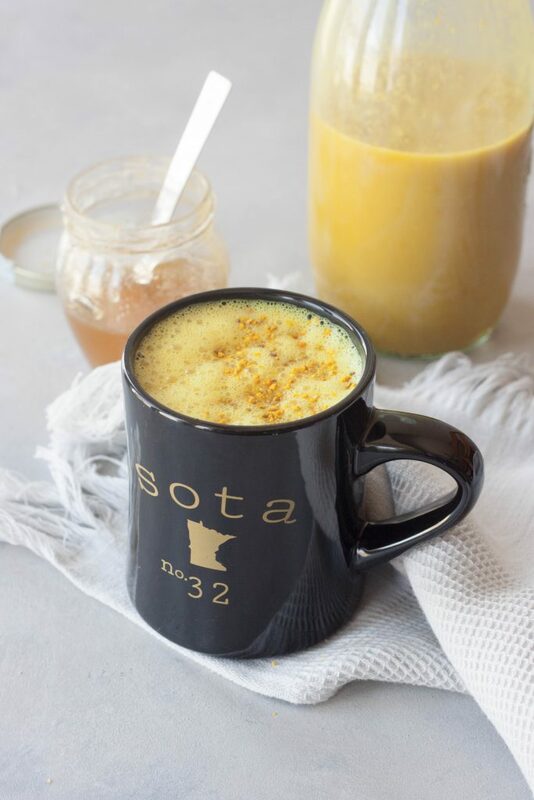 I also add a pinch of cayenne pepper so you get this smooth sweet sip of golden turmeric milk with a little bite or kick at the end, hence the name Bee Sting Turmeric Latte. It also seemed fitting using my favorite local honey which I’m loving so much and brings me back to my days of pure sweet honey from Ireland and eating plums drizzled with honey every day for a month. A use to love drizzling it on croissants. We use to get a local honey from someone my father knew but weren’t able to get it and for I was using agave but after finding a local honey I love it’s back to being a staple. It’s also great for allergies and there is just something so simple and sweet about it. What else is in this amazing Bee Sting Turmeric Latte and hey since it’s a latte does that mean it has coffee in it? For starters there is no coffee, crazy I know some of you are thinking since I’m a coffee lover and it’s called a latte. While you can add it I like it without. I usually enjoy this latte post workout or at night (I love it with lavender honey at night) so no need for coffee since I’m trying hard to cut out late night coffee. If I do whip one up in the mornings I will just do my two shots of espresso on the side so I can fully enjoy all the flavor and each sip of this turmeric latte. So what is in it if there isn’t coffee non dairy milk, turmeric, fresh ginger root, a pinch of black pepper, cinnamon, coconut cream, honey and a couple optional ingredients like maca powder, collagen, and bee pollen. When it comes to milk I like to use either coconut milk and I add in coconut cream to make it extra thick and creamy and for added fat to help absorbtion. If I don’t use coconut milk I use homemade cashew, almond, or a cashew almond blend as I want to really be thick and creamy and higher in fat than store bought. I’ve also found that I don’t like many store bought brands of almond milk warmed up. If you have a favorite I’d love to hear it so I can try it if I haven’t. If using homemade nut milk I omit the coconut cream as it isn’t needed. 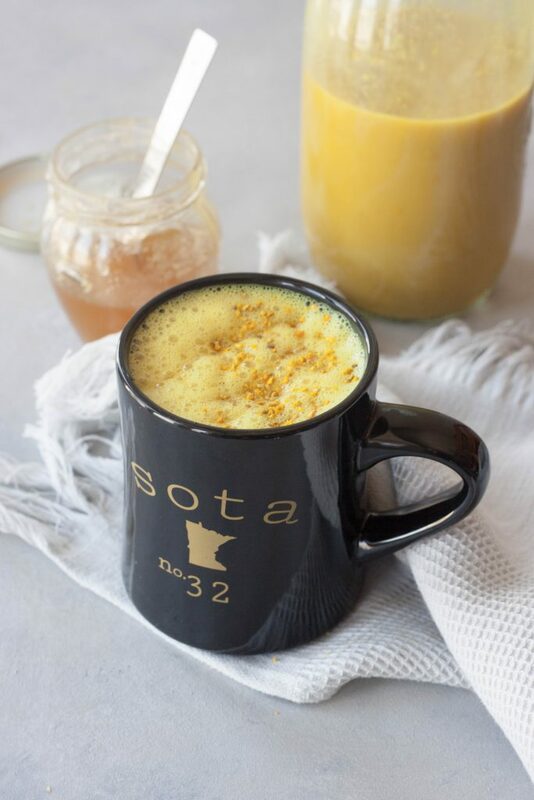 I like ginger so sometimes I also add a little extra ginger root which ups the “sting” in this drink but ginger, cinnamon, black pepper, and turmeric are staples in golden turmeric milk. I do omit the sweetener until I make my latte for a couple reasons but if you are making a latte and drinking it right away you can add it but I will go into that in a minute. I omit it because I make a batch of golden turmeric milk and by not adding the sweetener I can use it for anything like smoothies, smoothie bowls, turmeric lattes, oatmeal, or in baked goods and this lets me adjust the sweetness as I need it for what I’m making. If I make a smoothie or smoothie bowl it might not need the extra sweetness and sugar. I can always add it to what I’m making but can’t take it out. The optional ingredients, maca, oh I love my maca! I personally prefer gelatinized maca powder as it’s easier to digest, raw maca is said to have more total nutrients, I use what works for me. Maca is an adaptogen, simple definition adaptogens are a rare group of plants that help balance the body. Aside from balancing the body and help it deal with daily stress it’s said to help with energy levels but without the side effects like coffee and other stimulants. As I’ve written about many times I first started using maca about 7 years ago for fertility and hormone balancing reasons. I’ve continued to take it to keep things balanced and to help my body deal with stress. I’ve just recently started using collagen as I’m aging and seeing if it will help with my skin, hair, nails, and joints that are needing a little extra care as I get older. It also contains a little protein, the verdict is still out on results but if you are one of the many that use collagen, I’ve been seeing it every where, you can add it if you want. Last the bee pollen. It’s said to be good for allergies and your immune system which is why I use it as a garnish on smoothie bowls and this Bee Sting Latte, especially in the spring. There are many other reasons people like it as it’s packed with nutrition such as enzymes, amino acids, B vitamins as well as others, protein, antioxidants and more. For me that isn’t a sole reason to take it. I’ve also heard it’s good for beauty, blood and heart health, fertility, and athletic performance but have not done a lot of research on those. Now to make your Bee Sting Turmeric Latte! There are a couple ways but as I said I like to make a batch of Unsweetened Golden Turmeric Milk, usually 3-4 cups or even for a couple days. Then I will add the coconut cream, honey, cayenne, gelatinized maca powder, and collagen if I’m adding it. Either stirring it in or if I have my Vitamix out for something or making more then one blending it in there quick. I then steam it using my espresso machine. It’s quick and simple. There are a couple other options to make it quick and easy. You can heat your Unsweetened Golden Turmeric Milk and blend it up with the additional ingredients and this will make it nice and frothy. You can also heat and use a hand frother. Or lastly you can make a batch on the stove each time and just whisk the additional ingredients in at the end. I also picked up some fresh turmeric root and will be playing with that but it should be the same recipe just that it will take close to 3 times as much turmeric root as it does powder and I figure most people have ground turmeric on hand. *Making homemade Vanilla Cinnamon Almond Cashew Milk omitting the sweetener and cinnamon. To make Unsweetened Golden Turmeric Milk bring milk, turmeric, ginger, cinnamon, and pepper to a boil over medium heat whisking occasionally. Whisk in optional coconut oil if adding and reduce to simmer for 5 minutes. Place in an airtight glass jar or bottle the refrigerator to chill. I try to make only what I know I will use in 2 days. Start by making Unsweetened Golden Turmeric Milk. If making a Bee Sting Turmeric Latte at the same time whisk, or blend in a blender for frothier drink, additional ingredients in. Pour into a mug and top with optional toppings. If making the Unsweetened Golden Turmeric Milk ahead of time (as noted in my above post) heat turmeric milk and then blend in coconut cream, honey, cayenne, and optional ingredients. Or blend ingredients together and steam milk. Pour into a mug and top with optional toppings. Enjoy! Delicious rich and creamy turmeric latte that’s honey sweetened with a bite of spice. Healthy way to relax and recovery post workout or anytime. I am intrigued by the honey and the cayenne! It’s the perfect sweet and spicy combo! 😉 Not spicy spicy but just the right amount of bite. What a great recipe. I don’t even know if I know where to get local pollen around here or even think to put it in food. I’ve always heard eating local honey helps with seasonal allergies but pollen is new to me. I get mine from a local co-op, this summer hopefully from my favorite local honey as I’ve already told them I’d like some when they have some. I’ve been working on a turmeric latter, but it’s just not quite right yet. YOURS looks amazing!! I used to put bee pollen in smoothies, but haven’t bought any since we moved to Idaho. That’s a bummer, is it the milk? Or what are you missing? I hope you enjoy this one! I love turmeric and I’m right there with you, always looking for new ways to enjoy it! This is gorgeous! What a great way to eat turmeric…and that honey drizzle is perfection! wonderful recipe. It looks so good. I will try do it. thanks for sharing. Hope to see your new recipes soon. Love that golden color! The honey drizzle sounds like the perfect addition! I just can’t get enough of the color, it always brightens my day! Everything about this sounds amazing! I’m always looking for new recipes using turmeric! I’ll have to make this one soon! I think you’ll love it as much as I do! I’m right there with you always looking for new ways to enjoy turmeric. Thanks for this post. Yes to tumeric! I’ve enjoyed reading so many of your posts as a subscriber to your blog. I’m wondering if you’d be willing to become a regular reader of my blog: http://christinanifong.com. I’d love for you to follow along on WordPress.com and/or sign up for my weekly email newsletter here: http://christinanifong.com/2017/04/stacking-up-a-satisfying-salad/. The signup box is on the righthand side. Thanks for considering!